TravStar1 Point Of Sale SystemManager's Work Station GlossaryWhat Are House Account Customer File Fields? What Are House Account Customer File Fields? Customer - Enter the customer’s name. Address 1 & 2 – provides space for you to enter the customer’s street address, post office box, etc. City / State – Enter the customer’s city and state. Zip Code – Enter the customer’s zip code here. Contact – Enter the name of the person to be contacted when calling or corresponding with this customer. This field may be skipped if no specific person is to be contacted. Telephone – Enter the customer’s telephone number here. Credit Limit – Enter the maximum allowable credit to be extended to this customer. This field is shown at the top of the screen next to the current balance field to alert the operator. Tax # - Enter the customer’s tax identification number. This field is optional, and may be skipped. Tax Exempt Check Box - Check this box if the customer is tax exempt, or leave this box unchecked if the customer is not tax exempt. Payment Days – a 3-digit numeric field for the number of days in which payment from this customer is due. This is used to calculate the due date on the receivable entry screens. Payment Discount – An optional 5-digit field for entering the percentage rate used in the computation of discounts on this customer’s bill. The percentage number is entered as a whole number, such as “10.5” for 10.5%. Notes - Appears on the POS screen whenever the customer is selected. Enter any additional information you want included in this customer’s file. Projected Sales – Enter the projected sales amount for the customer. 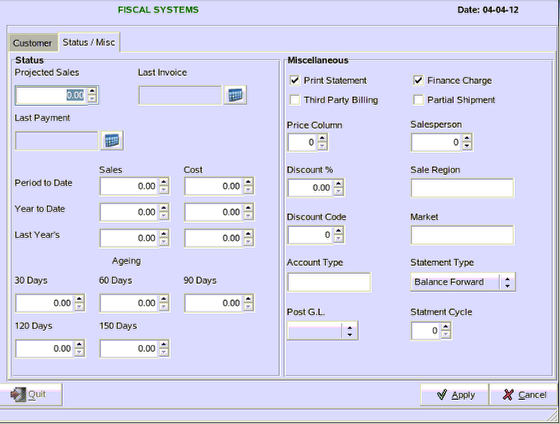 Last Payment – A date field in the format MM-DD-YY or MMDDYY. This field is automatically updated by the system with the date of the last receipt on account for this customer. Sales – Amount fields which are updated by the system as transactions are processed for this customer. You may manually enter figures here in the initial customer setup. Cost – Amount fields which are updated as transactions are processed for the customer. You may manually enter figures in these fields during the initial customer setup. Aging – The aged balances for the customer account. Print Statement – A check box used to indicate whether the customer is to receive statements. Finance Charge – A check box used to indicate whether a finance charge is applied to the customer. Price Column – Enter the inventory price column the system would use in sales order processing and inventory control / point of sale. The price column field works only if the discount code field is set properly. Discount % - An optional 10-digit numeric field used in the format used to enter a percentage rate for computing customer discounts on invoices. Discount Code – An optional 1-digit numeric field used for defining discounting schemes for a customer. This code interacts with the discount % and price column fields on the customer and stock files. The price column discount features require the installation of FIS-CAL’s Sales Order Processing and / or Inventory Control/ Point of Sale modules. 0- Customer discount as set on Customer File (Discount %). 1- Customer discount as set on Customer File (Discount %). 2- Customer discount and price discount (combination of codes 0 and 1). 3- Use only the Price Column discount A-F as set on the customer File (Price Column) and completely ignore the quantity discounts on the inventory stock record. 4- Use the Discount % field and Price Column discount field as set on the customer file and completely ignore the quantity discounts on the inventory stock record. 9- No discount to be given to the customer. Sales Region – An optional 3-character field to enter a code which identifies the sales region in which the customer is located. Market – An optional 3-character field to enter a code which can identify the type of market the customer is in. 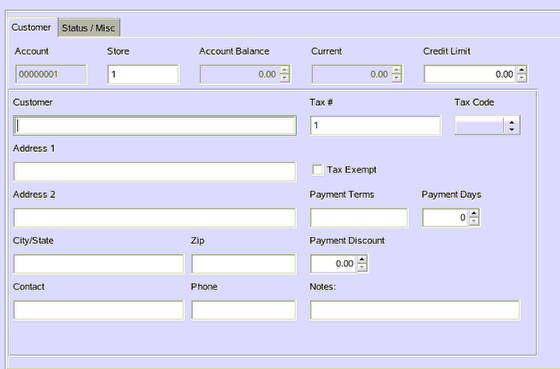 Account type – An optional 1-character field for setting up multiple receivables. Z account type is used only for one-time customers that are deleted at period end if their account balance is zero. Statement Type – A 1-character field to define the method of aging customer transaction. Select Balance Forward, Open Item, or Revolving. If you do not make an entry in this field, the system automatically sets it to Balance Forward. Partial Shipment – A check box to identify whether a customer accepts a partial shipment. Post G.L. – A 1-character field to define the method of posting to the General Ledger. Select “G” to post transactions to the General Ledger, “S” to do Summary posting, or “Z” for NO posting. Prev: What Are Auto-Field Change Fields? Next: What Files Should Be Sent to the Register?